This week has been an absolute blur of work, friends, holiday planning, birthdays and usual chaos. And now all of a sudden it is Thursday. How did that happen? During my prep for next week which just happens to include my mother and my birthday. I came across this recipe and had to share. Cheesecake can be a birthday cake right?! Either way it looks amazing and is on the menu this weekend! Beat the Philadelphia cream cheese and sugar with an electric mixer until smooth. Stir through the gelatine. Divide mixture into 2, fold dark chocolate through one half of the mixture and white chocolate through the other. Fold half the whipped cream through each. Fold mixtures over the prepared base. 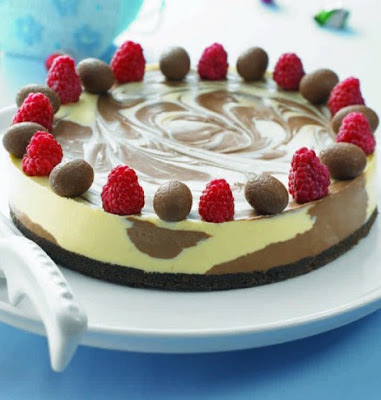 Use a knife to swirl the mixture into a marble effect. Decorate with fresh raspberries prior to slicing.